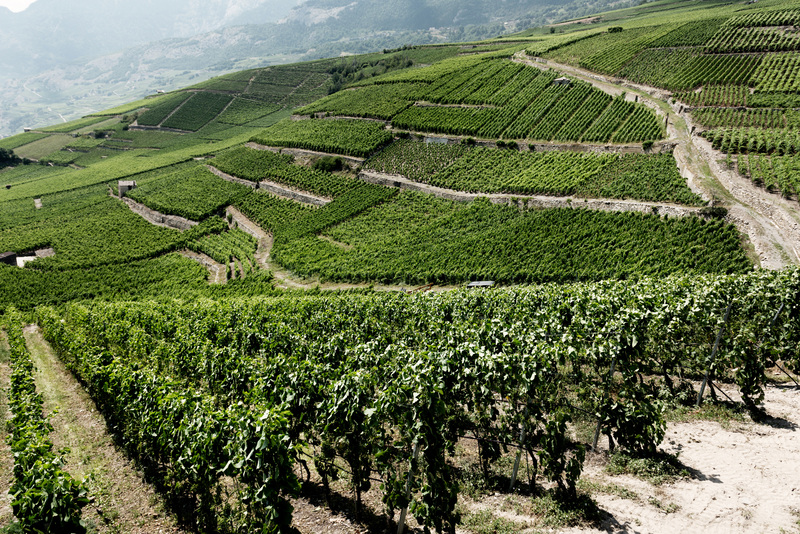 This estate is one of the oldest Swiss wineries founded in 1886. Urbain Germanier harvested his first vintage in 1896 at Balavaud (a hamlet in the commune of Vértroz) and devoted his life to his vineyards. His three sons, Francis, Paul and Charles later took over and the winery is now in its 3rd generation under the direction of Jean-René Germanier and his nephew Gilles Besse. Gilles Besse was 24 when he was approached by his uncle, who is only 7 years his elder, to join the family winery. At that time, Gilles was a jazz saxophonist in Geneva and had absolutely no knowledge about wine. He rose to the challenge and began studying oenology in the Swiss school of Changins and in 1993, vinified his first wines at the estate, nestled in the heart of the Valais. Together, Gilles and Jean-René have been farming sustainably for nearly twenty years and have ultimately pioneered a qualitative winemaking revolution in Switzerland. Out of love for the art of winemaking, quality remains the utmost priority. Located in the southwest of Switzerland lies the wide, glacial Rhône valley known as the Valais—one of 26 cantons that form the Swiss Confederation. The Valais region benefits from a particular microclimate as a result of its latitude and the fact that the valley is situated in between the Bernese Alps in the north and the Pennine Alps in the south. Home to the highest peaks in the Swiss Alps, more than 50 mountains exceed 4,000 meters—the highest of which reaches 4,634 meters (15,203 feet). At altitudes like this, it is no wonder this region is one of the wettest in the country. Having said that, air loses its humidity when passing summits above 4,000 meters and forces a strong, dry, downward wind into the Rhône valley (known as the Föhn), deeming it the driest valley and wine producing region in Switzerland. This continental dichotomy creates ideal growing conditions; the crisp, dry air provokes a diurnal shift that is particularly helpful in the spring when the risk of frost is high, as well as in the fall, helping to ensure slow ripening. Overall, the Valais plain receives less than 600 millimeters of rain per year and more than 2,000 hours of sunshine during the growing season. In addition to the climate, many vineyards are situated on the slopes of this alpine valley, most of which are conveniently oriented to the northeast and southwest. At 5,000 hectares, the Valais is the largest AOC in Switzerland and accounts for a third of the total wine production, most of which is red (more specifically, pinot noir). But there is plenty of white wine as well and the most notable variety is Fendant—a local synonym for Chasselas, only used in the Valais. Bordered by Italy in the south (Valley d’Aosta and Piedmont) and France to the southwest, it is no wonder this region boasts wines of quality. 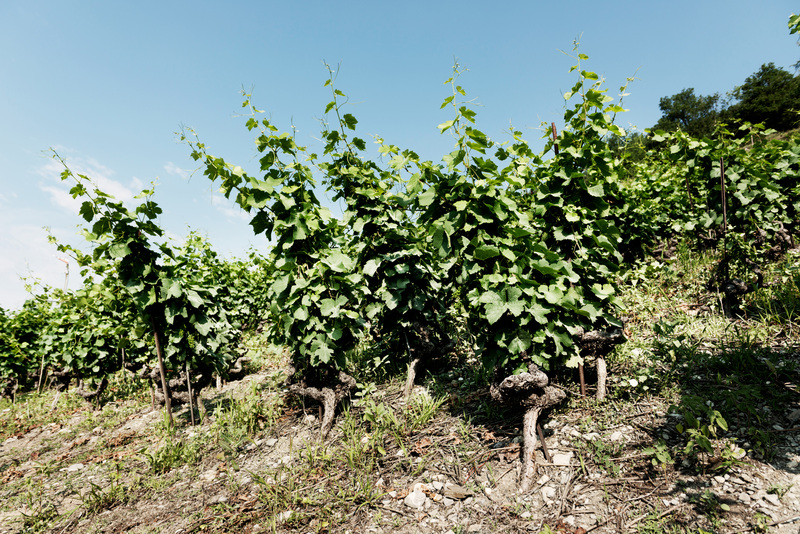 One of the key philosophies in the vineyards for Gilles and Jean-René is striking a balance between the amount of leaf surface and the quantity of grapes on the vine—an extremely important relationship when it comes to photosynthesis; more leaves means more vigor which often results in an abundance of grapes with low concentration. Leaf plucking and dropping fruit controls yields and boosts flavors. In addition to lowering yields, farming organically without the use of herbicides and pesticides, harvesting by hand and employing rigorous table sorting, these two are seeking forgotten varieties of the Valais that are awaiting rediscovery. Hyper focused on preserving the tradition of the region, they are replanting indigenous varieties (particularly Amigne and Syrah) and conducting soil studies to assure they are planting in soils that are conducive to said varieties’ ability to flourish. For the past five years Gilles and Jean-René have been farming in accordance with Bio Suisse—an achievement only three wineries in Switzerland can claim. The Swiss Rhône Valley encompasses a diversity of soil types, three of which are most notable: black slate, alluvial gravel and silt. The slate is found on the terraced slopes, influenced by the “mother rock” of the mountain, and imparts hydric stress during the growing season. 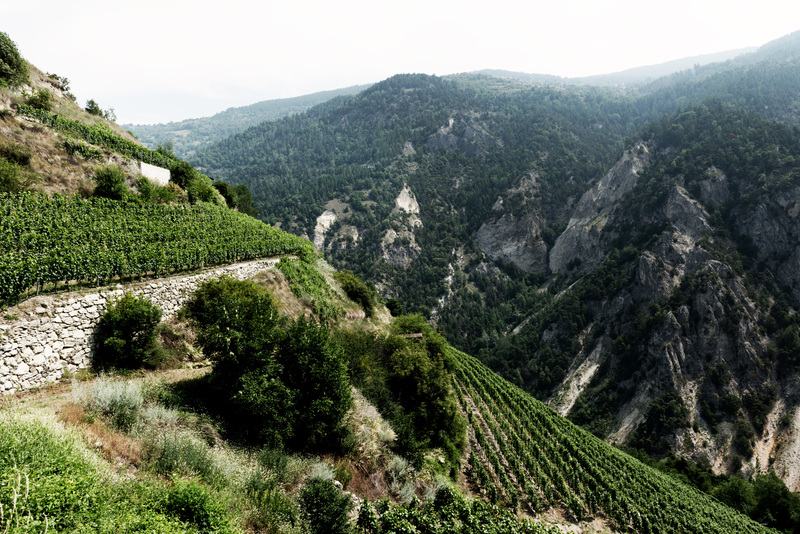 The second main type are the alluvial soils, created from the lateral valley of the Rhône. These soils are made of round gravel and a high proportion of silt. They are colder than the other two and retain more water. Lastly, at the bottom of the slope lies the ancient Rhône Glacier moraine which links the soils of the plain to those of the mountain. Here you will find a very fine mix of slate, gravel and silt. While Gilles and Jean-René are still operating in their ancient bicentennial vaulted cellar (where their earliest vintage was pressed in 1896), they are constantly in search of innovative winemaking techniques and new technology with the shared goal of making pure wines, implicative of their respective terroirs. In the cellar, they intervene as little as possible. They ferment with ambient yeasts and closely monitor temperatures. Whites ferment in temperature controlled vessels and remain on the fine lees, with intermittent battonage, until bottling. “Classic” wines are aged in tank while “Reserve” bottlings are aged in barrel. The reds undergo cold maceration prior to fermentation, see regular pigeage throughout, and are aged in barrel. Jean-René Germanier has proven their commitment to quality and are producing wines of pronounced character. We are thrilled to be working with their wines in the U.S.
2017 was a very special vintage. The frost was the strongest ever and we lost about 40% of the production. Concerning the 60% left, the season was good—very hot the whole summer (with three heat waves) that resulted in small grapes with low yields. The harvest started on September 11th and finished on October 14th. This timing is 2 weeks earlier than the average over the 10 last years. So the wines will be quite rich and concentrated with lower acidity than 2016 while still maintaining freshness. The winter was mild and rainy and the vineyards started to grow in mid-April. A quite cold period ensued after a rainy May resulting in late flowering in the middle of June. The second part of summer was very dry and hot and the ripening was very slow. The harvest began on September 26th and ended in the first week of November. The winter was quite mild and the vineyards began to grow in mid-April and was followed by a very rainy May. Summer was hot and vineyards were subjected to hydric stress- what was very good for ripening and overall quality. The harvest was very early, beginning on September 8th. Yields were low and concentration was high. Winter in 2014 was the warmest in the last 150 years. Spring was very dry and hot and bud break occurred 10 days earlier than the average vintage. After a dry and cool June we experienced a very rainy July and August. In September the warmth returned and increased humidity. These conditions attracted a new insect (Drosophila Suzukii) that attacked the grapes and caused some damage. Luckily October was very hot and dry and the grapes ripened well just in time for harvest. After a very rainy February, the spring was cold which led to late and poor flowering that ultimately resulted in very low yields. Summer started out chilly and dry and ended with very warm temperatures. Autumn was also dry and very sunny; the ripening was slow and harvest began on October 7th and lasted until early November. Low yields and slow ripening made for a great vintage with good acidity and high concentration, resulting in very fresh wines. 2017 Fendant Vétroz "Les Terrasses"